Dhaka, 10 August, Abnews: A view exchange meeting between UGC and the Vice-Chancellors of Public Universities was held today (10.08.2017) at its auditorium on various problems of public universities of the country. Professor Abdul Mannan, Chairman, UGC presided over the meeting. Tribute was paid to the memories of Father of the Nation Bangabandhu Sheikh Mujibur Rahman and his family members, who were brutally kill on 15 August 1975 in the meeting. Professor Dr. Md. Harunor-Rashid, President, Association of Universities of Bangladesh and Vice-Chancellor, Patuakhali Science and Technology University led on behalf of the Vice-Chancellors of public universities in the meeting. Vice-Chancellors, in the meeting, elaborately discussed various problems of their respective universities and sought assistance and cooperation from UGC to solve these problems. The Vice-Chancellors urged to the UGC for taking necessary measures to increase the facilities for the university teachers so that meritorious students are attracted to the teaching profession, which will play a significant role in ensuring quality at tertiary level education. 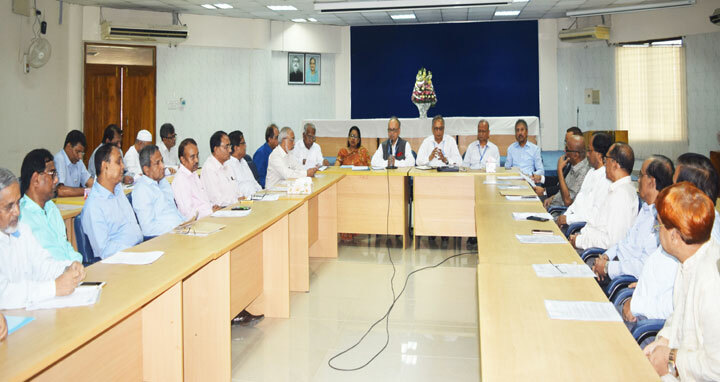 Welcoming the Vice-Chancellors in the meeting, UGC Chairman said that UGC will extend all necessary assistance and cooperation to the University for enhancing the quality education at tertiary level. He urged the university teachers to extensively conduct research activities for creation of new knowledge and dissemination of it for the betterment of the nation and country. He called upon them to hold the first-year honors admission test for the 2017-2018 academic session in a coordinated way so that no admission seeker are not deprived of taking part in the admission test. He also urged the Vice-Chancellors to run the academic and administrative activities of the public universities by properly following government rules and UGC framed guidelines. Professor Dr. Mohammad Yousuf Ali Mollah, Professor Dr. Dil Afroza Begum, Professor Dr. Md. Akhtar Hossain, Professor Dr. M. Shah Nowaz Ali, Members, UGC, Vice-Chancellors from different public universities, Dr. Md. Khaled, Secretary, UGC and high officials from UGC, among others, were present in the meeting.